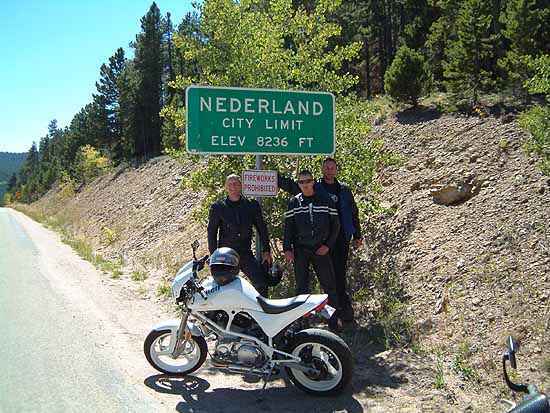 We have a Nederland over here as well! Welcome from the west of the US, Arizona. Congratulations on your bike collection. I converted from dirt bikes a couple of decades ago. I like bobbers too. My current Sportster is one of HDs early 1200N models. I have to visit that!!!! Thank you all for the really warm welcome! Welcome to the forum from the east coast of the UK. I like your K75 BMW. Those guys in the picture are Dutch friends of mine, who came over for a visit. I took them riding in the Colorado mountains. They got a big kick out of that sign, so we stopped and took a picture.